Results found that every seven-point increase in behavioral regulation over the school year predicted between three weeks and 2.8 months of learning gains in vocabulary, math and literacy. (CORVALLIS, Ore.) – A study by an Oregon State University faculty member shows that preschool age children who do not master basic self-regulation skills such as paying attention and following instructions may fall behind in academic subjects including math and reading. Megan McClelland, an associate professor in the Department of Human Development and Family Sciences at OSU, and her colleagues used a game called the Head-to-Toes Task to assess a child’s ability to listen, pay attention and regulate their own behavior. The researchers found that children’s performance on the behavioral regulation game significantly and positively predicted early literacy, vocabulary and math skills even after controlling for initial skills in those areas. These findings contradict a recent controversial study that found weak or no association between children’s socioemotional skills – including attention – and learning. In contrast, McClelland and other leading child development experts across the country find a direct correlation between specific aspects of school readiness such as self-regulation and academic success. The Head-to-Toes Task that McClelland and her co-authors used as a measure of behavioral regulation requires attention, working memory and inhibitory control. More than 300 preschool children were tested at two different sites in Michigan and Oregon. The study controlled for age, gender and other background variables. McClelland said that some of the new research pointing to the overriding importance of early math and reading skills was based on less sensitive measurement of social skills and self-regulation, compared to relatively strong measures of early achievement. McClelland said the Head-to-Toes Task is a strong predictor of early achievement because it does not rely on parent or teacher reports, which can often be biased. Instead, it independently assessed the child’s ability to follow multiple instructions in the game and tracked their progress over the school year. McClelland’s findings on the link between behavioral regulation and academic skills came out in the summer edition of Developmental Psychology. Another paper that assesses the reliability and developmental trends of the Head-to-Toes Task, authored by McClelland and lead author Claire Cameron Ponitz of the University of Virginia, will be published in Early Childhood Research Quarterly in early 2008. This Study when paired with the study, “The Effects of Kindermusik on Behavioral Self-Regulation in Early Childhood,” which was conducted in 2005 in the psychology department at George Mason University in Virginia; you see a very positive corelation. Consistant and frequent participation in Kindermusik classes will assist your child’s readiness for school and increase the likelihood of academic success. So when you bring your child to Kindermusik you can be assured of providing him/her with a very valuable skill, plus having FUN! What could be better! Register NOW for Spring 2008! Hop on the hayride—it’s time to head for the farm! In the first unit of Kindermusik Village, will will sing songs about the farm, engage in rituals and playful activities for baby and caregiver, including infant massage, lap bounces, exercise, and quiet time. During our second unit, we will stop and smell the roses—and lily of the valley, and tulips, and pansies as we play and move together to songs about spring. At Home Materials include 2 CDs of beautifully arranged songs from class, 2 fun and beautifully illustrated board books, and 2 age-appropriate instruments for music-making at home. Hop on the train, get in the car, board the plane, and Away We Go! This delightful unit focuses on transportation, a favorite topic for toddlers who are on the go, go, go! Explore fast and slow, smooth and bumpy, and high and low. Read stories about ways to get around. Move, play, and sing together in developmentally appropriate activities created just for 1 1/2 to 3-year-olds. 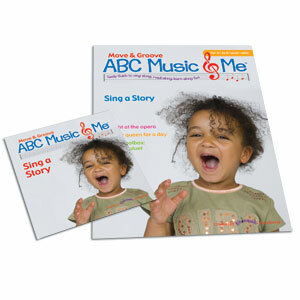 At home materials include 2 CDs, a Home Activity Book, 2 storybooks (Shiny Dinah and Giddy-Up! ), 2 harmonicas, and a train carrying box. What’s more exciting to a preschooler than a new toy? How about an entire Toy Shop full of toys! This unit is focused on creating a stimulating musical environment that integrates music, pretend play, story telling movement, and more. Toys I Make, Trips I Take introduces the musical environment of a remarkable toy shop, filled with boats, trains, balls, jack-in-the-box and many other toys that bring a glimmer into a child’s eyes. Each week provides your preschooler an uninterrupted session of imaginative play that’s guided in a very specific, sequential way—with a special Family Sharing Time with you in the last 15 minutes of class. At Home Materials include two CDs, Family Activity Book, Toy Shop play set, a drum, two beautifully-illustrated storybooks and a backpack. In Make Way for Music, families will sing, dance, and move their way through an exploration of several elements of music: beat and rhythm, concepts and contrasts (such as staccato and legato, high and low, the major scale, and arpeggios), the human voice, instrument families, and ensemble. 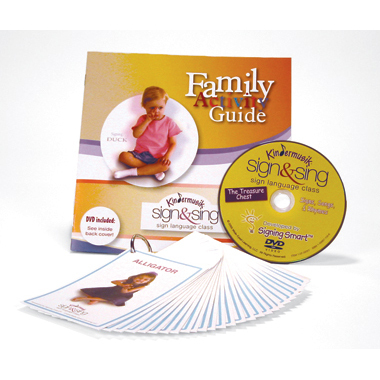 They’ll engage in developmentally appropriate activities that the whole family can enjoy together, including fingerplays, songs, circle dances, story time, and family jam. In their At Home Materials, families will receive two fingerdrums, one Sing, Play, & Grow home activity guide, two children’s storybooks (Drum Circle and Animals on Parade), a hand puppet and finger puppet of Rex (the lion member of Family Time’s Jellybean Band), and an instrument-matching board game. Get the family band together, and Make Way for Music! In class we’ll explore the rhythms and sounds of Native American music. As we investigate, compare, and contrast a wide variety of drums and the materials they’re made from, your preschooler develops the investigative vocabulary she’ll need in the sciences. When you repeat that learning pattern at home and share the activities in your Student Kit, your child gets an early start in math, too. Student Kit includes jingle stick, CD, and mini-literature magazine. February – Sounds AboundThis month we’ll use a new instrument: our bodies. In class we’ll explore all the sounds we can make with our mouths, our bodies, and our own two hands. With your Student Kit find instructions for instruments made from found objects around the house and play along with the music. Do so and your preschooler develops an early understanding of technology and how one material can be used to make something else. Activities in your Student Kit help you bring these big ideas home when you take part in the listening, turn-taking, and sound-effect making activities. 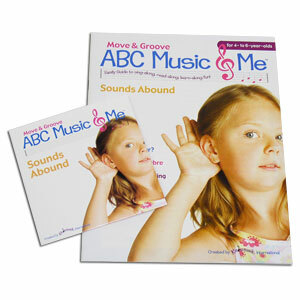 Student Kit includes CD and mini-literature magazine.March – Dance With MeThis month, we’ll feature the music and dance of “one-two” rhythms, and “one-two-three” rhythms. In class, we’ll hear real instruments from the ballet and learn a few dance steps, too. Activities like dance, where your child follows a short sequence of instructions, helps to strengthen memory and his ability to follow directions. At home, play the CD in your Student Kit and let your preschooler show you a new step or two. Student Kit includes lumi stix, CD, and mini-literature magazine. Session A: Everyday items around the house—a ball, bubbles, mom and dad—become the objects of learning in the classroom and at home. 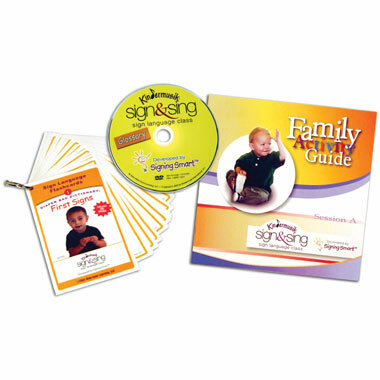 You’ll teach parents the sign language methods of the experts, such as making the sign in front of a child, on a child’s body, and knowing when a child is most engaged and ready to learn. All assembled in this easy-to-understand format so you can open your teacher’s kit, and be in the classroom teaching with confidence. Why Music? Here is one school district’s opinion and I agree! It is exact, it is specific and it demands exact acoustics. A conductor’s score is a chart, a graph which indicates frequencies, intensities, volume changes, melody and harmony all at once and with the most exact control of time. Most of the terms are in Italian, German or French; and the notation is certainly not English – but a highly-developed kind of shorthand that uses symbols to represent ideas. The semantics of music is the most complete and universal language. It requires fantastic coordination of fingers, hands, arms, lip, cheeks and facial muscles in addition to extraordinary control of the diaphragmatic, back and stomach muscles, which respond instantly to the sound the ear hears and the mind interprets. It allows the human being to take all these dry, technically boring (but difficult) techniques and use them to create emotion. This one thing science cannot duplicate: humanism, feeling emotion, call it what you will. Not because we expect you to play or sing all your life. Can’t get enough of those Bottle Bands – Check this one out! Thank you Michele and Sara for this great link! Enjoy your Thanksgiving today…have a laugh! A bottle band special… Whoa Christmas is coming! The Bottle Band of Copenhagen playing beautiful music … I bet they were Kindermusik Kids don’t you? Thanks Michelle for the heads up! It has been a nice day…I am looking forward to seeing my daughter Rosalie and her husband Paul tomorrow. My daughter Kendra and I spent some time together today and my husband and I this morning and this evening. I have had phone calls and emails with birthday regards. It has been a nice day…. Thanksgiving Day! What are you thankful for? Thanksgiving has always been a day of family and friends for me. This year will be harder than usual as we won’t be with our daughter and son-in-law, their professions require them to work with the less fortunate in their communities. We won’t be traveling to visit family out-of-town and we will miss them! Instead it will be small and probably include my husband’s sister and her friend. This year is also the first year we have a vegan daughter! No Tofurkey though! We will make a small Turkey and enjoy it! As much as our daughter Kendra loves to cook, we will probably be blessed with some delicious vegan dish to add to the table. I hope your Thanksgiving is blessed with family and friends and some turkey too! Ever wonder what the pilgrims and their Native American guests really ate at the first feast? The truth may surprise you. Contrary to popular belief, they didn’t sit down to a meal featuring turkey, corn, cranberries, and pumpkin pie (in fact, they didn’t even have forks!). Travel back to Plymouth and discover some of the humble origins of Thanksgiving traditions we celebrate today and what the original celebration was actually like! These links are from The History Channel an excellent source of information regarding our heritage. Infant & Toddler QuickSource(R) is an excellent tool for Parents! This teacher guide is also a wonderful tool for parents of homeschoolers and other parents in need of ideas or interested in trying out fun things at home that focus on the developmental ages and stages of your children. Observe and identify developmental stages for infants. Find experiences that help reinforce and support developmental milestones, aiming to build the foundation of learning. Infant caregivers must understand that all essential guidelines for infants revolve around the domains of language, cognitive, social/emotional and motor development. Exploration, perception, communication, mobility, self-competence, trust, relationships, independence, and impulse control (beginning around 18 months) are all developmental goals for infants. This invaluable, easy-to-use resource provides comprehensive support across eight domains of emergent learning for children from birth to 18 months. Children from birth to age three are in the most critical period for language development. Children in the toddler years are active explorers and need many small and gross motor activities as well as opportunities to problem-solve. Because this is a prime age for building connections within the brain, language, cognitive skills, social emotional development and physical development are the four areas of focus for the toddler group. The developmental guidelines in this QuickSource are categorized into eight learning domains. At all times, however, the guidelines provide an emphasis on the four areas above. The Evolution of Dance ~ too funny! As we have just finished up our Kindermusik Village DoSiDo classes I know you are still dancing those crazy dances at home with your baby! The brave may want to add some of these moves for fun!